kiev - the swimmer, originally uploaded by . IM. It looks like "Imperfect Me" (what a great screen name) has a very similar style of photos to my own (though I make no claims to being as good a photographer as her). 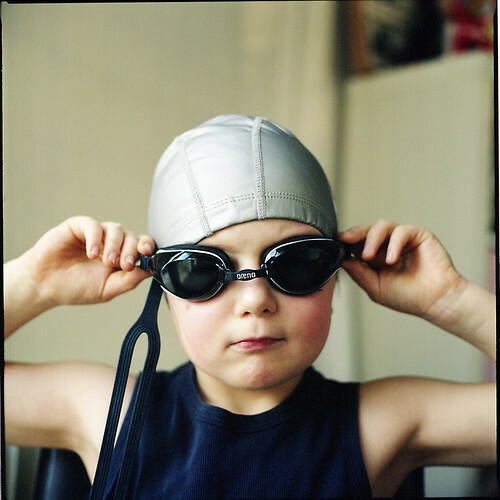 She takes a lot of pictures of her family, especially this little fellow; many of her photos involve unconventional angles or settings, or capture an interesting moment; and she's also fascinated by patterns of light. Which photo to feature? The soulful kid with the big eyes? The kid enduring a hair cut, or posing for Mommy yet again on the stone steps? In the end, I couldn't resist this photo, which reminds me so much of the pictures I've taken of my own son, so serious and yet so comical at the same time: a beautiful portrait of the soul of a child.